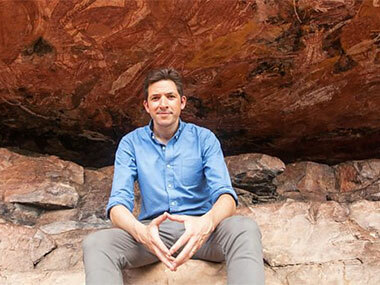 He's young and he's earnest, he's British and he's white, and he's telling the Brits all about Aboriginal art. Well, in Australia, it couldn't happen. Because, increasingly, only Aboriginal people are allowed to take on that interpretive role in film and television. We're therefore most unlikely to get to see James Fox's 'Oceans Apart' - which is a BBC TV series currently being screened there actually covers art right across the Pacific but starts in Indigenous Australia – on our local screens. Which justifies, I think, my telling you how this British picture is painted. For, although Nicholas Thomas, the Australian-born Professor of Historical Anthropology at Cambridge is credited as advisor to the series, I note that his most significant publication – 'Islanders: The Pacific in the Age of Empire' – suggests an expertise in Oceania rather than Indigenous Australia. So young James Fox takes us to the Arnhemland rock country and offers us Alfred Nayinggul, a local ranger but not, apparently an artist, extolling the importance of Country in the Kunwinjku tongue. Cut to the monumental Injalak Hill, though, and it's Fox himself telling us about the rock art that covers its caves and overhangs – not a local artist, such as Gabriel Maralngurra, who is soon demonstrating how to paint an Kongara, as Britain's James Cook originally spelt the word. That choice seemed pretty questionable – though it did allow Fox to draw us to his main theme that here was “a quality and continuity” of art-making that was unique in the world. I'm not sure that his subsequent linkage from Neolithic man to the Greeks, the Renaissance and right through to Picasso as a parallel to the continuity of Aboriginal art really made sense – however dramatic. For, while Aboriginal images of kangaroos, based, as Fox rather nicely put it, on the artists' knowledge of the animal, 'inside out”, have changed little, and have had no reason to change over the aeons, neolithic man wouldn't have a clue what Picasso was on about today. At about 11 minutes into the program, though, we seemed to have done with Aboriginal art! Mysteriously, we're lead back to Britain and the convict artist Thomas Bock who tried to poison his 17-year-old pregnant lover, failed and was sent to Van Dieman's Land. Yes, he painted sympathetic portraits of Tassie Aborigines just as they were being exiled to the Bass Strait Islands – especially the winsome, doomed Mathina. But it wasn't Aboriginal art! And nor was Arthur Streeton's 'Golden Summers', examined in depth for its Impressionist associations, but seemingly in the show mainly to prove that the people who'd done so much to disrupt a society that had “survived through its art” for 60,000 years were taming the landscape only for profit. That sort of anti-colonialism lies behind much that follows – the photographer/cop Paul Foelsche capturing memorable images of NT Aborigines only as evidence of their inferiority; Aranda woman Clara Inkamala telling us of her grandfather's death in custody; the Indigenous population falling from 300,000 to 80,000 in the first century through disease and massacre. Actually, the ABS currently suggests 750,000 as the most likely number in 1788! Inkamala leads on, of course, to Albert Namatjira. And here I was grateful to young Fox for the first time for his conclusion that, despite the problems wrought upon his life by citizenship and racism, Namatjira's ubiquitous ghost gums were in a sense self-portraits. Cut to the Bardon myth, magnified by Fox's peculiar claim that Papunya was “six hours down the road from Alice Springs”! Did he go there? Fortunately, he concentrated his attentions on Mick Namarari's 1977/8 masterpiece, 'Sunrise Chasing Away the Night', and, once again illuminated it pleasingly by seeing it, not just as an aerial view, but as a view conceived from above the stars and the sun. Oddly, Mick was identified as a former “cattle rancher” and an “amateur artist”. Fox seems to have forgotten his argument about the mnemonical value of images that replaced the written word in pre-colonial Oz. But that's as far as he takes the classical art of Aboriginal Australia. No post-Papunya developments in Utopia, The Kimberley, the APY Lands or by Arnhemland masters such as John Mawurndjul or 2018 NATSIAA-winner Gunybi Ganambarr. Perhaps there was pressure to incorporate the unrelated world of urban/Blak art – which prominent member Reko Rennie recently admitted was a totally different kettle of fish: “I think there’s a real romanticised notion of what is Aboriginal art,” Rennie told The Australian. “They put us all into one category, which is just not the case”. Picking on Dale Harding, though was intelligent of Fox – his roots are solidly back in his ancestral Carnarvon Gorge; though Harding was there to prove that “the art isn't finished”, which surely Mawurndjul or Ganambarr could have done just as well! I'm not sure where consultant Prof Thomas was when young Fox makes the claim that Capt Cook was the first European to engage with mainland Australia. He would surely have known that the Dutch ship Duyfken engaged with Cape York in 1606 and found the locals as unenthusiastic about welcoming them as they were in 1770 when Cook tried to land in Botany Bay! But I trust the Brits will ignore this touch of chauvinism in favour of the program's conclusion that for Aborigines, “Art is hope, it's income and self-respect. It's people reclaiming their Country”. Connected to the BBC TV series is an exhibition at the Royal Acdemy in London. 'Oceania' has just opened in the Academy's Main Galleries and runs until 10 Dec. Unlike the TV series, it would seem to exclude Australia as it's organised by the RA in conjunction with Musée du Quai Branly-Jacques Chirac, Paris, Prof Thomas's Museum of Archaeology and Anthropology, Cambridge. Supported by Arts Council of New Zealand Toi Aotearoa. Supporting partners: The Kingdom of Tonga and Papua New Guinea. 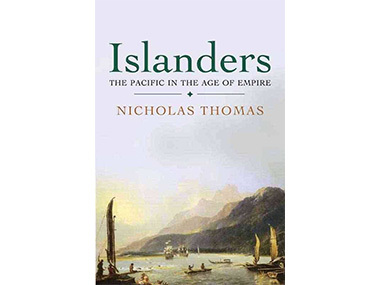 Nicholas Thomas's Islanders: The Pacific in the Age of Empire. The Australian-born Professor of Historical Anthropology at Cambridge is credited as advisor to the series.